Telangana TSPSC Vaidya Vidhana Parishad Staff Nurse Exam 2017: Telangana State PSC invites online applications from the candidates for Staff Nurse vacancies in Vaidya Vidhana Parishad under Health and Family Welfare department of Telangana State. 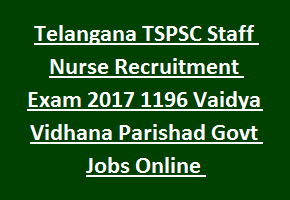 There are total 1196 Staff Nurse Vacancies available in Telangana State TSPSC Recruitment. Applications will be received through TSPSC official website @www.tspsc.gov.in. Last Date for submission of application form through online is 11-December-2017. Selection for Telangana State TSPSC Staff Nurse Jobs Recruitment 2017 will be based on CBRT Computer Based Recruitment Test or Offline OMR based examination. For more details regarding Pay scale, number of vacancies, Age details, Selection procedure, Qualifications, Exam pattern and Exam Syllabus details of Telangana TSPSC Vaidya Vidhana Parishad Staff Nurse Jobs Recruitment 2017 are given below. Vaidya Vidhana Parishad Staff Nurse notification of Telangana PSC Govt Jobs Recruitment. TSPSC Online Applications starting date: 16-Nov-2017. Last date for TSPSC online submission: 11-Dec-2017. TSPSC Staff Nurse Examination date: Jan 2018. Hall Tickets/ Admit card can be downloaded 7 days before the date of commencement of Examination. There are total 1196 vacancies available in Telangana State PSC Health and Family Welfare Department. Department Name: Telangana Vaidya Vidhana Parishad & Health and Family welfare Department. Posts name: Staff Nurse- 1196 posts. Candidates must have qualified 3 -1/2 years Nurse Training Course GNM (General Nursing Midwifery) Diploma course or its equivalent examination or BSC Nursing from a recognized Institution/ University. The candidate's age limits as on 1st July 2017 for General is 18 years to 44 years and Upper Age relaxation for reserved candidates is up to 5 years, 10 years for PWD candidates. Selection for this TSPSC Health and Family Welfare Department recruitment will be held based on Computer Based Recruitment Test or Offline OMR based Test (objective type). Examination date and Centres will be uploaded soon on official website of TSPSC. Objective Type multiple choice written test will be conducted for 150 Marks. Examination duration is 150 minutes. Total 150 questions will be given and consist of two papers. Salary for this TSPSC latest recruitment vacancies is Rs. 25,140 to Rs. 73,270/-. Online application fee for all candidates is Rs.200/-, Examination fee for general candidates is Rs. 120/-, for other category candidates is Nil. Candidates having eligibility criteria can submit their applications through online before the closing date i.e. 11-12-2017 using TSPSC official website @www.tspsc.gov.in. Before applying online read the user guide carefully from TSPSC official notification. Upload Photo and signature scanned copies in given sizes. In Telangana Social Welfare Residential Educational Institutions Societies: 121 posts. In Mahatma Jyotiba Phule Telangana Backward Classes Welfare Residential Educational Institutions Societies: 135 posts. In Telangana Minorities Residential Educational Institution Society: 195 posts. In Telangana Residential Educational Institution Society: 32 posts. In Telangana Tribal Welfare Residential Educational Institution Society: 50 posts. For category wise vacancies please see the TSPSC official notification.